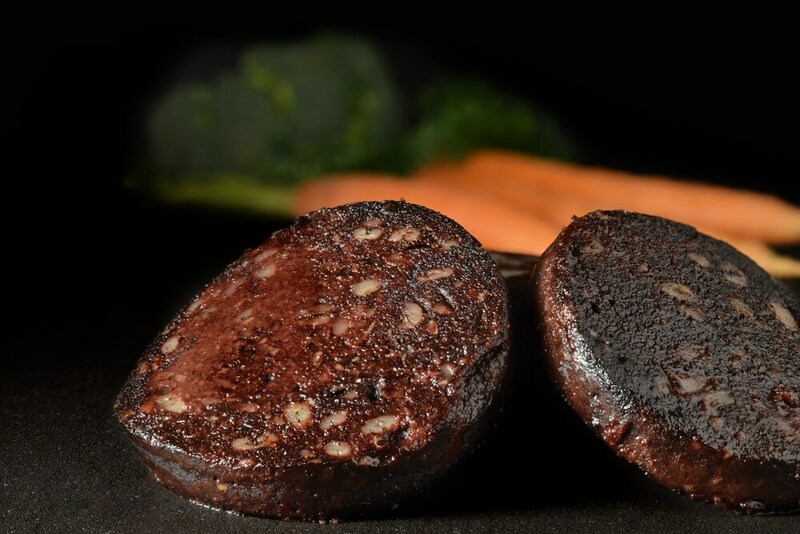 Black pudding goes well with just about any food from scallops to bacon to whichever veggies you have on hand. Apples are an especially popular accompaniment to this traditionally British and Irish delicacy. This particular recipes gives the Apples a flair by caramelizing them in butter and flambéing them with bourbon. It makes for a light but rich snack or lunch. Have the following ingredients on hand. Start by cooking the black pudding. Don’t try to multitask and do the black pudding and apples at the same time. Black pudding cooks quickly and easily burns if you are not careful. Now, there are many ways of preparing black pudding. Use the one you like most. To fry it, add slices of black pudding to hot oil in a pan over the stove. Cook each side for 3-4 minutes. To grill, place the black pudding slices on a pre-heated grill and cook for 3-4 minutes one each side. Spray the grill with a bit of oil to keep the slices from sticking. You can also simmer the black pudding in water. Wait until the water comes to a gentle simmer in a pan before adding the sausage. Keep the heat at low – the water shouldn’t boil – and leave the black pudding to cook for around 6 minutes. Remove and slice into 1cm discs. Just slice the black pudding and cook in a microwave for 60 to 90 seconds at full power. Cut into 1cm slices and place on a lightly oiled baking sheet. Bake for 6-8 minutes in a 190C oven. Turn the slices over midway through. Core the apples and cut into 1/8” slices. In a medium skillet or saucepan, melt the butter using medium heat. When the butter melts and starts foaming, add the apple slices and pour the lemon juice over them. Keep turning until the apples caramelize and become tender. It takes about 10 minutes. Pour the bourbon over the apples and give it around 30 seconds to warm up. Then ignite with a match and wait for the fire to burn out. Your flambéed apple slices are ready. Serve with the black pudding slices and garnish with whatever you want – mixed salad leaves, carrots, some smoked bacon, sour cream…it’s up to you.